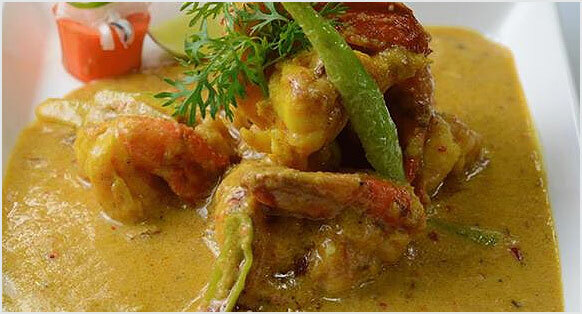 Many Indian restaurants around the globe till late 90"s are influenced by North Indian Cuisine. 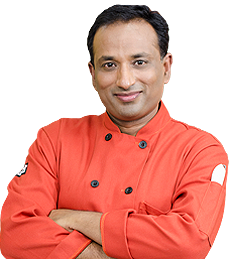 Indian restaurant cuisine has been influenced by Indian chefs who have migrated from North of India Specially Punjabi style restaurants. They created a fusion of the two great cuisines-the local and the Home bought Indian Cuisine by adopting cream sauces in their Indian recipes. 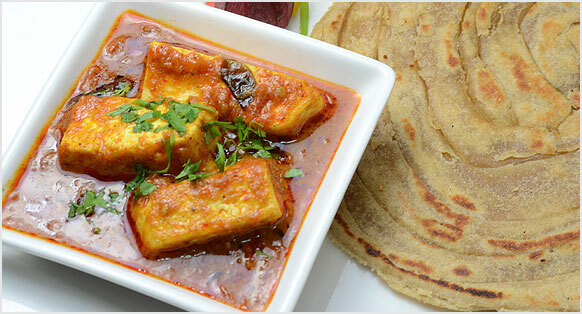 North Indian cuisine is distinguished by the proportionally high use of dairy products; milk, paneer, ghee (clarified butter), and yoghurt (yogurt, yoghourt) are all common ingredients. Gravies are typically dairy-based. Other common ingredients include chilies, saffron, and nuts. The Mughal influence has resulted in meat-eating habits among many North Indians. Also, a variety of flours are used to make different types of breads like chapathis. rotis, phulkas, puris and naan. The samosa is a popular North Indian snack, and now commonly found in other parts of India, Central Asia, North America, Britain and the Middle East. A common variety is filled with boiled, fried, or mashed potato. Other fillings include minced meat, cheese (paneer), mushroom (khumbi), and chick pea. The staple food of most of North India is a variety of lentils, vegetables, and roti (wheat based bread). The varieties used and the method of preparation can vary from place to place. Popular snacks, side-dishes and drinks include mirchi bada, buknu, bhujiya, chaat, kachori, imarti, several types of pickles (known as achar), murabba, sharbat, aam panna and aam papad. Popular sweets are known as mithai (means sweetmeat in Hindi), such as gulab jamun, jalebi, peda, petha, rewadi, gajak, bal mithai, singori, kulfi, falooda, khaja, ras malai, gulkand, and several varieties of laddu, barfi and halwa. Chicken or Paneer tikka - Succulent boneless breast chicken pieces or paneer, marinated in yogurt & spices, cooked in the tandoor oven until tender, served with mint/yogurt chutney Seek Kebab - Minced lamb, marinated with garlic/ginger & exotic spices, skewered & cooked in the tandoori oven, served with mint/yogurt chutney. 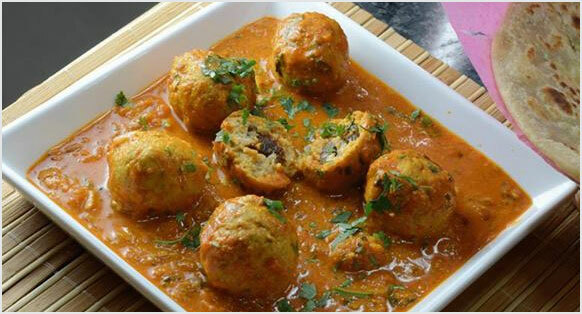 Paneer Kofta - Koftas of homemade creamy cheese ground with vegetables, mixed with nuts & raisins, deep-fried, served in a creamy sauce. Palak Paneer - Homemade cottage cheese, deep-fried & cooked in fresh pureed spinach, mildly spiced. A speciality from North India. Dum Aloo - Small potatoes, exotically flavored with fresh herbs & fresh ground spices, sauteed & cooked in yogurt sauce garnished with chopped coriander leaves Dal Makhani - Lentils cooked on slow fire with butter until tender, mildly spiced & complimented with fresh herbs. "kachumber" salad Cucumber and yogurt raita"
North Indian cuisine has some typical features that are interesting. There are popular things like Buknu, Gujhiya, chaat. daal ki kachauri. jalebi. Imarti. several types of pickles (known as achar), murabba, sharbat. Pana. Aam papad, Poha-Jalebi (from Indore). There are several popular sweets (mithai) like mallai ki gillori, khurchan (from Mathura), petha (from Agra), rewdi (from Lucknow), gajak (from Meerut), milk cake (from Alwar), falooda, khaja (from Aligarh), Ras Malai. Gulab Jamun, Laddu, Barfi, Halwa, Gul Qand. Balusahi. A typical North Indian jneai would consist of chappatis,, parantha or poons (unleavened flat breads), pilafs, dais, curries that are mild and made in ghee, thick, creamy dais, vegetables seasoned with yogurt or pomegranate powder, lots of greens like spinach and mustard greens cooked with paneer. north Indian pickles, fresh tomato, mint, cilantro chutneys and yogurt raitas. Hot, sweet cardamom milk is very common before going to bed. North Indian desserts and sweets are made of miik, paneer, lentil flour and wheat flour combined with dried nuts and garnished with a thin sheet of pure silver. Nimbu Pani (lemon drink), Lassi (iced buttermilk) are popular drinks of the North. tandoori cooking is a north Indian specialty and famous the world over. tandoori chicken, naan, tandoori roti, tandoori kebabs are a hit in most Indian restaurants. Northern Indian cuisine has the following main schools of cooking: Kashmiri. Punjabi. Rajasthani, Marwari, Gharwal and Pahari, UP, Awadh or Luchnawi. Kashmiri cuisine evolved in the valley several centuries ago and in course of time absorbed some of the delectable elements of the Mughal art of cooking and thus enriched, acquired a personality of its own. A distinctive feature of Kashmiri food is the generous use of yoghurt in their gravies; the flavours of asafetida. aniseed, and dry ginger for pungency and saffron for the pulaos. Kashmiri food can be both a simple meal or a 36- course Wazawan where the nost commonly served items are rista (meat balls), tabak maz (flat pieces of meat cut from the ribs) rogan josh that takes on the colour of the Kashmiri chilies, Yakhni (a yoghurt based preparation with a delicate flavour) and the classic Gushtaba (pounded meat balls cooked in a yoghurt gravy). For the vegetarians there are aloo dum, chaman or fried paneer and haq saag. The meal concludes with kahva or green tea. The piece de resistance is the wazwan, the traditional 24-course banquet with many cooking ways and varieties of meat - some in curry, some dry, some pounded in various sizes. These are carefully cooked overnight by the master chef. Vasta Waza, and his retinue of wazas. Guests share the meal out of "a large metal plate called the trami: The meal begins with a ritual washing of hands at a basin called the tash-t-nari, which"is taken1 around by attendants: Seefch kababs of 4 varieties - methi korma. tabak maaz, safed murg and zafrani murg, and the first few courses. Seven dishes are a must for these occasions— Rista, Rogan Josh, Tabak Maaz, Daniwal Korma, Aab Gosht, Marchwangan Korma and Gushtaba. - Gram flour or Besan is a major ingredient here and is used to make some of the delicacies like Khata. Gatte Ki Sabzi and Pakodi. Powdered lentils are used for Mangodi and Papad. Bajra and corn are used all over the state for preparations of Rabdi, Khichdi and Rotis. Sweets include Laddoos. Malpuas. Jalebies. Rasogullgs, Mishri Mawa. Mawa Katchori. Sohan Halwa. Mawa and many more Banaras. India"s holiest city is in UP. It is famous for it"s bazaars full of jalebis", sweetmeats and a myriad variety of "kachoris"
Awadh style of cooking is world famous for its tender meat dishes and excellent sweets. The Nawabs of Awadh (now Lucknow) were great gourmets and encouraged their master chefs to . create new styles of cooking Thus the bawarchis of Awadh transformed the traditional dastarkhwan embroidered or white tablecloth laid on carpets or a low table) with elaborate dishes like kababs, kormas. kaliya. nahari-kulchas. zarda, sheQrma!. roomali rotis and warqi parathas. Dum (a process in which meat is cooked over a slow fire) popular all over the Islamic world became synonymous with Lucknawi kitchen. 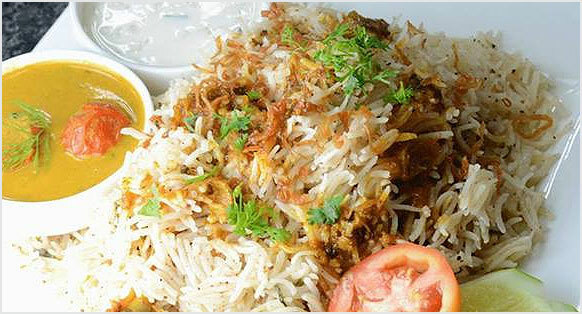 The richness of Awadhi cuisine lies not only in the variety of cuisine but also the ingredients used. - Sarson ka saag. originating from Punjab. This dish of mustard greens simmered and slow cooked over coals along with rajma, kali ma or lentils and served in dhabas or roadside stalls which many say has the best food in Northern India. The dishes are served with unleavened bread of cornmeal or wheat and a dollop of butter or with steamed basmati rice. Punjabi cuisine (from the Punjab region of Northern India and Eastern Pakistan). Punjabi cuisine can be non-vegetarian or completely vegetarian. The level of spices can vary from minimal to very prevalent. One of the main features of Punjabi cuisine is its diverse range of dishes. Home cooked and restaurant Pun,abi cuisine can vary significantly, with restaurant style using large amounts of clarified butter, known locally as desi ghee, with liberal amounts of butter and cream while home cooked food concentrates mainly upon wheat masalas (spice) flavourings. Though wheat varieties form their staple food, Punjabis do cook rice on special occasions. During winter a delicacy, Rao Ki Kheer, if cooked using rice. Rice is cooked for a long time in sugar cane juice. (which translates to "hot blend") is a word that is often used in an Indian kitchen. It is a blend of several spices. It is the most important blend and an absolute essential to north Indian preparations, added just before serving the dish to enhance its flavor Garam masala is a blend of cardamom, cinnamon, cloves and black pepper. Masala may be in dry, roasted ground or paste form. Each State in India has its own blend and each family is partial to their own blend and each cook is partial to his blend which may be many and which change daily. South India has a wonderful blend of wet spices where the spices are ground with various combinations of spices, fresh herbs and nuts. North Indian curries and dry vegetables are mostly flavored with whole cumin seeds. Cumin is considered to have digestive properties and is also considered to have cooling properties. Hint: Ground cumin has a short shelf life..
North Indian curries usually have thick, moderately spicy and creamy gravies. The use of dried fruits and nuts is fairly common even in everyday foods. Dairy products like milk, cream, cottage cheese, ghee (clarified butter) and yoghurt play an important role in the cooking of both savory and sweet dishes. Thanks to the fact that such a rich variety of fruit and vegetable is available at all times of the year, the region produces a dazzling array of vegetarian dishes. Jammu & Kashmir, Punjab, Haryana, Uttar Pradesh also have a rich heritage of non vegetarian food. North India has a rich tradition of fine sweetmeats as well. Cooking oils commonly used: Vegetable oils like sunflower and canola. Mustard oil is rarely used and only in some states of the region. Ghee is normally reserved for special occasion cooking. Important spices and ingredients: Coriander, Cumin, Dry red chillies, turmeric, Chilli powder, Cardamom, Cinnamon, Cloves, Garam Masala, Aniseed/Fennel, etc. 1) Butter Chicken This dish is among the best known Indian foods all over the world. Its creamy gravy can be made as hot or mild as you like. 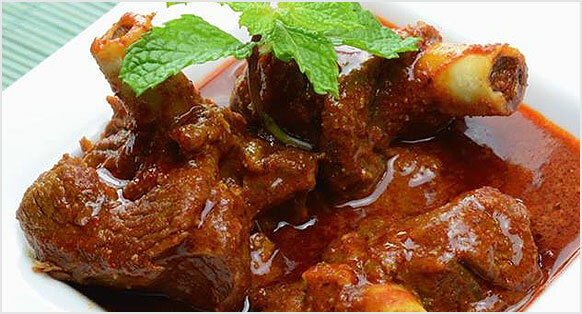 2)Rogan Josh The name may sound fiery but as the proverb says, its bark is worse than its bite! 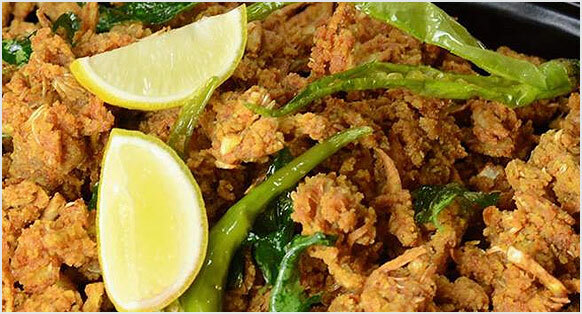 3)Fish Amritsari This fried fish dish is a great appetizer or side dish. 4)Mutter Paneer Delicately flavored Paneer (cottage cheese) teamed with peas, in a tangy gravy. 5)Rajma (red kidney bean curry) Serve Rajma with plain boiled rice, Kachu"mbar salad and your favourite pickle. 6)Chole (chickpea curry) Serve this crowd pleaser piping hot and accompanied by pooris/bhatooras (fried Indian bread). 7)Kheer (rice pudding) This creamy rice pudding is delicately flavored with cardamom and is full of nuts. It"s a great dessert for anytime of the year.